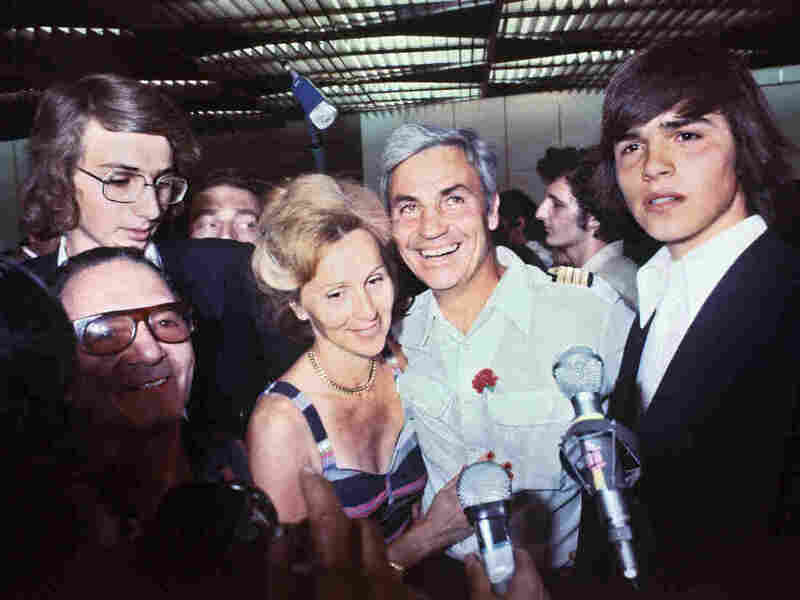 Pilot Michel Bacos was greeted by his wife at Orly Airport on July 5, 1976 in Paris, France after refusing to abandon his Jewish passengers held hostage by Palestinian and German terrorists. We may all wonder if we would act with courage in the face of catastrophe, emergency, or evil. Michel Bacos was captain of Air France Flight 139 on June 27, 1976, with more than 240 passengers and 12 crew, when it took off from Tel Aviv for Paris, with a stop in Athens. About eight minutes after takeoff from Athens, Captain Bacos heard screams and commotion. The plane had been hijacked by four terrorists from the Popular Front for the Liberation of Palestine, and the Baader-Meinhof Gang, a radical German group. They were armed, and told Captain Bacos to fly to Benghazi, Libya, then ruled by Moammar Gadhafi. One hijacker kept a gun against the captain's head. "Every time I tried to look in a different direction, he pressed the barrel of his gun against my neck," Captain Bacos recalled. He was 52 years old at the time. He had joined the Free French forces during World War II. The jet was refueled in Benghazi. The hijackers then directed Michel Bacos to fly on to Entebbe Airport, in Idi Amin's Uganda. The terrorists demanded $5 million and the release of dozens of Palestinian and pro-Palestinian militants imprisoned in Israel and other countries. They said if their demands were not met, they would start to kill the people they held hostage. The hijackers then began to separate the Israeli and Jewish passengers from all others. It was an order reminiscent of the grisly process of selection in Nazi death camps. "I fought the Nazis," the captain said later. "I knew precisely what fascism was all about. The genocide is a horror that none of us had forgotten." He tried to look after all his passengers, now hostages, in an empty air terminal. The terrorists declared that those hostages who were not Jews could leave, and fly on to Paris. Captain Bacos and his crew were invited to leave with them, but as he later told the BBC, "I told my crew that we must stay until the end, because that was our tradition, so we cannot accept being freed. All my crew agreed without exception." Israeli commandos landed on July 4, 1976, in what's become known as Operation Entebbe. Three hostages were killed during the raid; but 102 were rescued. On the flight back to Israel, the commandos put Captain Bacos in the cockpit, a gesture of respect for the fortitude of an old Free French soldier. When Michel Bacos died this week, at the age of 95 according to The Associated Press, he was saluted in France, Israel and around the world. In the midst of a murderous nightmare, the captain was a shaft of light.